I have a confession to make. I've been busy. In addition to being a mom, wife and full time employee, I've been social networking, writing and editing my skirt! story for the March issue, working out, and doing a ton of Mama things, all while starving. I want to start working on my Literary Mama essay now. Life is carrying me away and I haven't had time to blog here or on skirt! much lately. I also abandoned Twitter for a while and just showed up again recently. I have fallen in love with two websites, goodreads.com and livestrong.com. Good Reads lets you log all the books that you've read and rate them. It also lets you add friends who you can share your books with and your thoughts on those books. The other site Live Strong is part of the Lance Armstrong Foundation. This site has a SUPER COOL tool that you have to pay for on Weight Watchers but it's FREE on here. It's a tool called The Daily Plate that allows you to search for foods, even name brand and restaurant chains, and log them for each day. You can also log your exercise and it will tell you how many calories you burned against what you ate. I love this tool and it's really helping me keep up with how much I eat. 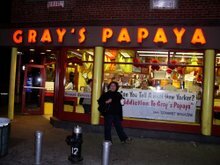 I used to pay for Weight Watchers Online a few years ago and I lost around 15 lbs just logging what I ate. I've reached an interesting turning point in my lap band journey. I keep hearing that people experience a much bigger challenge their second year. They report that it's harder to lose the second year and that sometimes complications arise. I can already see how that can happen. Starting with the stomach virus that I got in January, right after my one year anniversary, I have not really gotten back on track. Weight-wise I have. I'm back at the weight I was before the stomach virus and the month and a half break that I took. But I'm not back on track with eating. I'm afraid I may have come across a complication but I won't really know more until tomorrow. I've basically been starving since Monday. I haven't been able to really eat for the past 4 days. I've only been able to sip coffee, some protein shake and a tiny bit of chicken. Needless to say, I've been pretty miserable. I finally called the lap band clinic today and told them and I was told to come in tomorrow for an x-ray. So that's what's going on with me. Life. I'm behind on so many things! If you are in Houston this Wednesday, February 18 at 7 p.m. stop by Borders Bookstore (Kirby & Alabama) to hear Gwendolyn Zepeda read from her first novel, Houston We Have a Problema. The reading is co-hosted by the super awesome literary group, Nuestra Palabra, Latinos Having Their Say. I hope you can make it! I've been thinking and re-thinking the latest Literary Mama essay and I don't know if I can write anything this month. (I like to submit to their monthly writing prompt) I can write plenty, but not in relation to having income envy. What I mean by that is that the writer of the essay talks about how she stayed home with her kids and raised them and she writes full time. I could only dream of doing such a thing. I kind of have the opposite problem. I wish I could stay at home and write full time, but I can't let go of my full time income. We have a joke at work. We call our job there our "golden handcuffs." There's a funny thing about sales. You can have a couple of bad months then you'll have a series of really good months and those are the ones that keep you there. Thus the reason I went back to advertising sales 10 years ago after a four year break. Now that I've really tasted the fruits of my labor it's hard to stop. Where does that leave my writing? Like I've written before it leaves me time to write on lunch breaks, after work late at night, and weekends. I write on my blogs. But nearly not enough time to really feel like I can dedicate myself to a big project full time. So instead I do a series of small projects that fulfill that need to write. This month I'm working on three. I received a very cool invitation from KUHF to participate in a commentary on what KUHF means to me. They invited me because of my This I Believe essay. So I need to write something up for that and they'll record it at the station. I also need to start thinking about a March skirt! feature story. I have an idea of what I want to write but I also need to check with my editor, Dusty, about that. Then finally I am submitting to Literary Mama, but just not a literary prompt. I'm going to take an literary prompt that I submitted a couple of months ago and I'm going to re-work it to submit it as an essay. That one I'm not as sure about. I really want to submit something to Glitter Train again one day soon. Maybe not this month, but maybe next. I just need to get started on something good. I'm thinking of a short story that will turn into my novel later. That's my "writing life" and so no, I can't relate to the writer in this month's Literary Mama essay. I write "in between the cracks" of my life, as another Literary Mama writer put it so eloquently. I only dream of writing full time. That would only happen if I won a lotto, and I don't even gamble so the chances of that happening are pretty much none. I'll just keep writing the way I do. “¡Ya la vi!” exclaimed a little girl excitedly to her parents in Spanish. “She’s so beautiful!” said a young teenage girl in awe to her friend. They smiled and giggled shyly at being overheard. She wasn’t the only one who said it. The same comment was heard over and over again from several young women who all seemed to have a girl crush on Kat Von D.
Close to a thousand people packed the Barnes & Noble Bookstore at Westheimer and Voss in Houston Tuesday night to buy Kat Von D’s new book, High Voltage Tattoo and to stand in line for the famous tattoo artist from LA Ink (TLC show). The store sold out of 600 books within minutes and the line of customers snaked all the way around the 45,000 square foot store past the Starbucks and the bookcases. They all hoped for a chance to have their book signed and to have a few seconds of the TV star’s time. 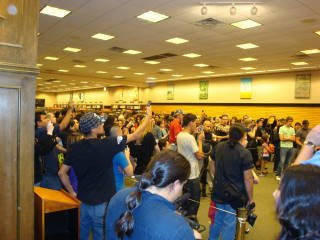 Kat Von D drew a crowd even larger than Oscar de la Hoya when he debuted his book at the same Barnes & Noble last year. All ages and variations of people made up the fans. There was the young Spanish speaking couple with their young children, White and Hispanic moms in their forties with their teenage daughters, teenagers with their friends, partners, and young men with tattoos. Definitely a lot of people with ink showed up. The event was hosted by Nuestra Palabra, Latinos Having Their Say. Kat Von D was very cool but there were a lot of people there, around 1,000. We stayed for a little while and then we went and got a margarita. I heard she signed books until 11! WOW! I have a feature story in the February issue of skirt! Go there now and read it! After you finish reading it, go to skirt! again to my blog and enter to win this book by Gwen Zepeda. I'm thinking I made it too hard, but it really isn't if you read my story about her on skirt and then google her cats on her website. If you don't want the book win it for a friend or family member or spread the word and tell people about it. I'm GIVING it away for FREE! On to other good news. After four wonderful years on blogger I have decided to buy ShoegirlCorner.com. Yes! It's mine! I bought it today. I don't know yet when I will make the switch over there but there will be a notice on here when I do. Yay! Rey (my husband) also bought a domain name and we'll be doing something surprising and cool with it. Stay tuned! I'm really excited to tell you what but I have to wait until Rey is ready to talk about it too. I'm not really into ink, but I want to support Nuestra Palabra and a Latina. Especially now that I found out that Kat Von D was born in my mother's hometown of Montemorelos, Nuevo Leon, Mexico. So, is she really Latina or does she just say she is because she was born in Mexico? Maybe I'll get to ask her tonight.